Pictures from the web New Tired & Retired For Sale! 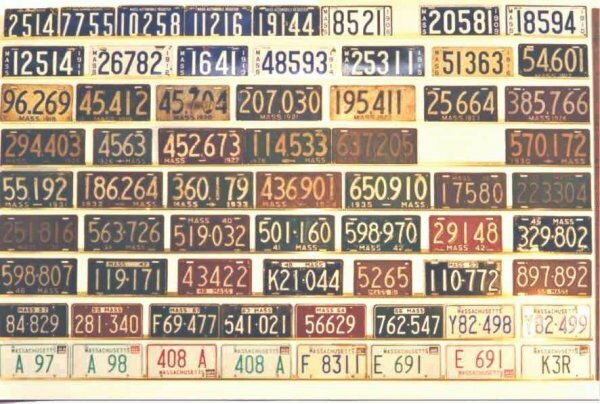 Here is what I have on display beginning with 1903, the first year Massachusetts license plates were issued. I'm missing one, the 1929 commercial Codfish plate with the fish swimming towards Massachusetts. This is commonly known as the "Good Luck" plate. The 1928 Cod plate, known as the "Bad Luck" plate, had the Codfish swimming away from Massachusetts. Copyright © 1999-2004 chandlercollection.com. All rights reserved.